Lazy Seamstress: Box pleats and pattern matching. box pleat, originally uploaded by Lazy Seamstress. Sometimes I get a bee in my bonnet and I have to go with it. Tuesday night watching The Great British Sewing Bee , and seeing many of the contestants struggling with the pattern matching and box pleats of the technical challenge, it occurred to me that I hadn't ever made a box pleated skirt where pattern matching was an issue. And I've certainly never had to pattern match box pleats under a time restriction with a camera pointing up my nose at the same time, so kudos to those on the show for keeping their sense of humour, I'm not sure I would have under those circumstances. I hope I would have had the sense to pick a stripe fabric and use it horizontally as my friend Vicki mentioned on Twitter. After watching the show, as is often the case I felt inspired to improve my sewing skills, and I simply could not get those box pleats out of my head. I resolved to make a box pleated skirt with perfect pattern matching! I should say at this point I had no thoughts whatever about how a box pleated skirt would suit me, or fit into my wardrobe, I was merely interested in the technical challenge. I didn't set out to make the exact skirt they made on the show, but simply to play with the pleats, and this I did in stolen moments over half term. After struggling with the African print, I began playing with this geometric print cotton. Again not ideal, but slightly better to work with. I pressed the pleats in, tacked them securely in place, and then began to construct my skirt. Two side seams, a lapped zipper and button fastening. I hadn't intended to make the exact skirt featured on the show, but I thought just for fun I'd half machine sew, and half hand pick my zip. I wouldn't usually hand pick a zip unless using a delicate fabric, or I particularly wanted to achieve a vintage look. For example Jemma's prom dress made last year ;the zip was entirely hand sewn into that delicate lace in the bodice. You may notice my side seams don't exactly match. Again I was working with the small amount of fabric I had and couldn't match front and back vertically without losing too much off the length. I machine stitched my waistband on too, as they had on the show. I have to say, I'm in full agreement with Julie who hand stitched her waistband down. that is my favourite method. I think it gives a nicer finish, but to push me out of my comfort zone, I top stitched my waistband. And yes, my waistband doesn't match! I had nowhere near enough fabric left to pattern match the waistband, so I flipped the design instead. 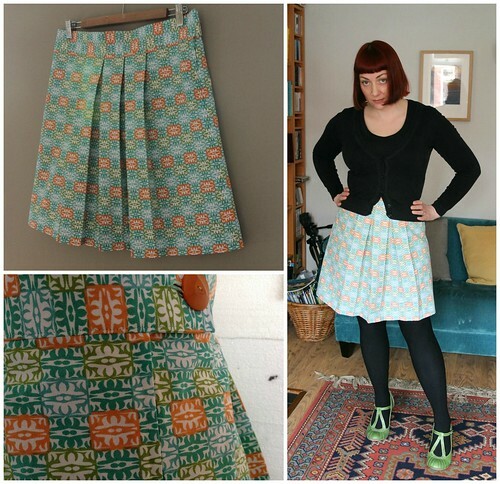 I finished off my skirt with a vintage button, and a machine sewn hem. Am I happy with the finished skirt? Well, yes and no. I enjoyed the challenge I set myself. I'm happy with the finish of my skirt, glad to have pushed myself out of my comfort zone of invisible zips and hand stitched waistbands. Mostly I'm happy with my pattern matching using a not really ideal print, but I really don't like this skirt on me! I may wear it in the summer with leggings and ballet flats. That might work. I'm not disappointed that I've made myself a skirt I don't really like, as I've already said, I enjoyed the challenge! As always you look effortlessly gorgeous! And that view haircut is not wasted on me neither!! Thank you San. The new hair I actually do like. Thanks Grace, yes I will try it again in the summer with some brighter colours. It looks great on you! I couldn't make that in a 1000 years! Love that fabric too. xCathy (p.s.Giveaway at mine if you like). I think it is a lovely skirt and really suits you! Love the new hair cut as well! I am making the box pleat skirt up can not work out how the pleats work. Only one on you tube but not clear enough. I love the skirt and your shoes!!! !